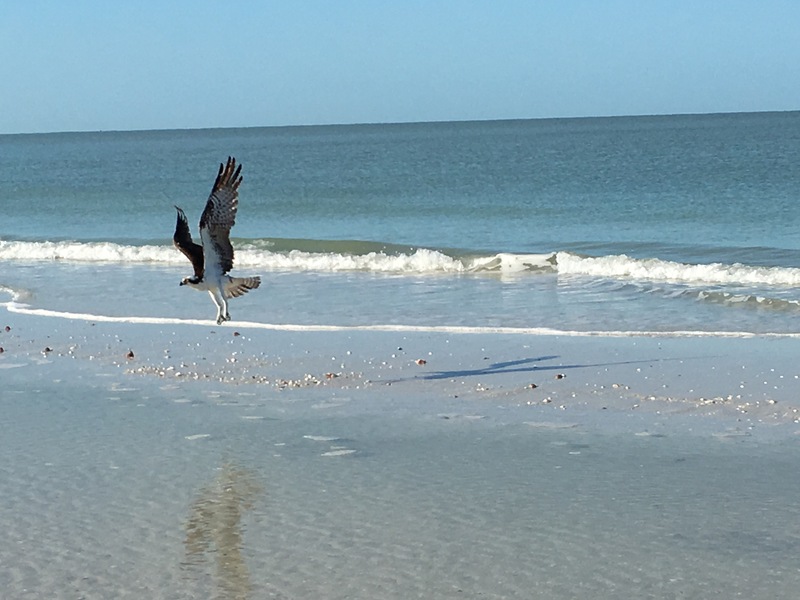 I have been on a family trip to Marco Island, Florida this past week. It has one of the best and most beautiful beaches in the US. There are sea shells everywhere and a wide beach of hard white sand. Some call the state of Florida the “gun shine” state. I was expecting to see people walking around with holstered guns. But I have not seen one person with a gun. 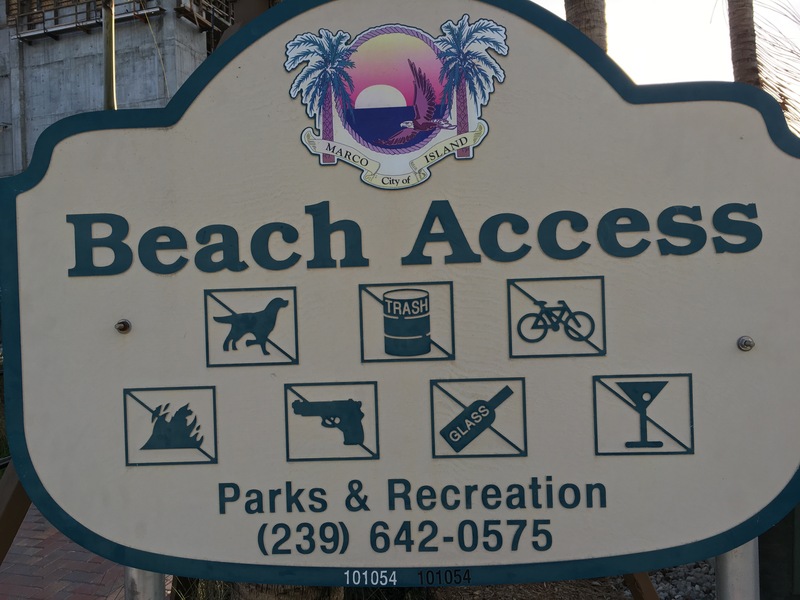 In fact, guns are not welcome on the beaches as my photo indicates. Why in God’s name would someone want to bring a gun to this beautiful pristine place? But never mind all of that. So far at least, Florida remains a state without open carry. And in another modicum of common sense, the legislature failed to pass a campus carry law. It’s always nice to see the gun lobby get turned down in their efforts to get guns into every nook and cranny of our communities. I see more guns carried in public places in Minnesota than I have here in Florida. Florida is known for looser gun laws and more gun deaths than many states. It is the home to the shootings of Trayvon Martin and Jordan Davis- the shooters of both young black men claimed as self defense. Luckily for the family of Jordan Davis, the shooter did not get away with murder. And we know about what a fine upstanding citizen George Zimmerman is. Florida is a laboratory for the NRA. What we see in Florida often shows up in other states. That is what Stand Your Ground in Florida started. A national trend. Lately there was an awful shooting here on Dec 31st in Florida when a mother shot her daughter in what she thought was a self defense shooting. Yes. This is more often the case than guns used for actual self defense. All gun deaths are terrible tragedies. But theses kinds of “accidental” shootings are avoidable and totally senseless. So I am wondering if it’s true that a lot of people carry guns in Florida or if that is just another gun lobby myth and exaggeration? Politifact found that Florida does, indeed, have the largest number of carry permits in the country. So I could be surrounded by armed people- or not. It wouldn’t be much different than sitting in a legislative hearing room in the Minnesota Capitol. Common sense tells us, of course, that carrying while enjoying life with the family isn’t a good idea. And it can’t be much fun to always be worried about danger lurking everywhere. Kids running around playing. People in kayaks, paddle boards, parasailing, sipping Pina Coladas, and all of those relaxing things people do. Having a gun at the ready is just not one of them. Meanwhile back in Minnesota, gun carriers are shoveling 12 inches of snow. Tomorrow I will fly back home to deal with whatever bills are proposed in Minnesota. Let’s hope we can pass a background check bill to require that all gun buyers undergo a criminal background check. That is one way to save lives and keep everyone who wants to buy or sell a gun honest and law abiding. There’s nothing wrong with that idea though we know the “registration” and “confiscation” argument has already been raised by the gun lobbyists. It isn’t true. Time for all of us to take a break from the old arguments, relax, and have the reasonable conversation we should be having. The corporate gun lobby loves to think that teachers or others should be allowed to have guns in our schools to protect children from insidious and tragic assaults by dangerous people with guns. Proclamations and myths about “gun free” zones being more dangerous than places where guns are allowed are the mantra of the gun rights extremists. And, stupidly, many of our politicians parrot these dangerous talking points. They are not based on fact or reality. Most gun deaths and injuries actually occur in “guns allowed” zones, like homes, on our streets and many public places where guns are allowed. Police officers are shot on a regular basis even though they are armed and those who shoot them know they are armed. It’s a myth. An elementary teacher at Wagner Community School is expected to make a full recovery after accidentally shooting himself in his home, law enforcement said. Travis Barthel, a third-grade teacher at Wagner Community School, took a bullet from an accidental discharge of a 9 mm pistol on Feb. 26 in his home on the outskirts of Avon, according to Bon Homme County Sheriff Lenny Gramkow. Barthel declined to comment on the matter Monday. According to Gramkow, Barthel had the pistol in his coat pocket. At about 6:20 p.m., the coat fell to the floor after Barthel took it off, and the pistol fired one bullet upward into Barthel’s stomach and through the back of his left shoulder. Why would we think this teacher would be any safer in a classroom with that gun? There are other examples of “accidental” discharges in schools by gun carriers that, luckily, did not result in death. I have written about them many times in this blog. Remember that these are the people the gun lobby wants carrying guns or having guns somewhere in our schools to keep our children safe. Remember when a Utah elementary school teacher ( where guns are allowed in schools) “accidentally” discharged her gun in a school bathroom? There was a time when gun permits were only granted to those who showed a need to carry a gun ( for work or under conditions of necessary self defense) and law enforcement was given the authority to decide who, in their communities, should be granted a permit to carry a loaded gun around. All of that changed in 1987 when Florida, the laboratory for the gun lobby, passed a “shall issue” carry law. A few other states had passed such laws before that but Florida is a laboratory for the gun lobby so what happens in Florida can be expected to show up in state legislatures all over the country. Every state now has some version of a law allowing private citizens to carry guns in public. “Our study finds that, that homicides go up by 7 to 9 percent in states that pass the laws, relative to states that didn’t pass the laws over the same time period,” he says. Hoekstra obtained this result by comparing the homicide rate in states before and after they passed the laws. He also compared states with the laws to states without the laws. Still, based on the available data, it appears that crafters of these laws sought to give good guys more latitude to defend themselves against bad guys. But what Hoekstra’s data suggest is that in real-life conflicts, both sides think of the other guy as the bad guy. Both believe the law gives them the right to shoot. In a separate analysis of death certificates before and after stand your ground laws were passed in different states, economists at Georgia State University also found that states that passed the laws ended up with a higher homicide rate. The gun rights extremists want us to believe that the new normal is seeing people with holstered (or not) guns in public and we should not “wet our pants” about it. When that person could be anyone- with no training or even a permit with a background check requirement- we are supposed to trust this person to be safe in public? I don’t think so. Why would any reasonable person believe this is a good idea? I saw a man just the other day outside of a McDonald’s restaurant where I was sitting with my grandchildren and some friends. Needless to say, the boys noticed immediately that the man was carrying a gun openly and were fascinated by the gun. Our children don’t need to observe adults carrying guns around in public. It is NOT normal. The thing is, gun use for self defense is so minimal as to be hardly on the radar. The incidents of someone using a gun for legitimate self defense are just not making the news. Or at least not as often as mass shootings, domestic shootings, “accidental” discharges and other gun incidents. They aren’t making the news because they are so infrequent comparatively. So back to the incident of the school teacher whose gun discharged and injured himself- this happens far too often in our country. I write about these incidents frequently. In fact, my news feed and Twitter feed are littered with articles about kids finding guns and shooting themselves or someone else or “law abiding” citizens shooting a loved one(s) , themselves or someone else by “accident” or in a dispute that would not end in death if a gun was not at the ready. Mandatory training, background checks, permits and even licensing and registration are required for so many other every day things Americans do. The idea that because gun rights are deemed to be sacrosanct by the gun lobby there should be absolutely no accountability is ludicrous. And dangerous. Guns in schools will not lead to safer children unless they are carried by law enforcement or legitimate security personnel. Or not. Check this out. And this. It’s important to think through what we are doing to keep our children safe from gun violence. The most important thing we can do is to prevent shooters from gaining access to guns in the first place. That will not stop all shootings, of course. But the fact that we aren’t really trying is a national shame. Satire is often needed to make the point that America is doing virtually nothing to address its’ public health and safety epidemic. Check out comedian Samantha Bee’s video about school shootings and the corporate gun lobby. As always, the language is ripe and provocative. But the message is clear. What are we teaching our children about safety in schools? And why are children exposed to lock down drills and ways to stop shooters? They are children. They are in school to learn. Parents should expect that their children will come home alive after school every day. Americans have had #Enough. Changing laws, changing the conversation and changing the gun culture will lead to safer communities and fewer gun deaths and injuries. Education, awareness, training, proper storage of guns and common sense is what is needed to keep families and communities from the devastation of insidious gun violence. Some people hate Hillary Clinton. They hate her with a fervor that is unreasonable and over the top. Often there is no reasoning with these folks, many of them Bernie Sanders supporters. I just can’t figure out that kind of hatred. I don’t hate Bernie Sanders. I don’t hate Ted Cruz, Marco Rubio or Donald Trump. I vehemently disagree with their policies and their tactics. And I am actually fearful for our country if Donald Trump were to be elected our President. It is beyond my capability to comprehend that this could happen. I happen to support Hillary Clinton. Her positions fall into line with mine, for the most part. Especially her views about guns and gun violence. There are a few things on which I will disagree with her. No politician is pure. They disappoint us because we want them to represent everything we believe. We want to trust them. And then reality happens. Debate happens. Compromise happens. And soon enough, we are not happy. Wayne LaPierre and the gun rights extremists have had Obama derangement syndrome since the day he was elected ( or before). Claims of gun confiscation and hysteria over gun rights have been flung around for 8 years. Interestingly, guns have not been confiscated nor have rights been taken from anyone but those who should not have guns. Everyone in the community is struggling to explain what would cause the 17-year-old boy, David Cunningham to do this. His father, Tom Cunningham, didn’t want to speak on camera. But he gave us some clues about his son’s growing despondence. Tom Cunningham is trying desperately to cope with the horrifying scene. Returning from town, he saw the family’s German shepherd dead on the back step. Inside lay the bodies of his two teenage children. “No, we have no motive at this point,” Meeker County Sheriff Brian Cruze said. Two teens are dead. A 17 year old boy was despondent. He had access to a gun. More investigation will reveal what kind of gun it was and where it came from. And now another family and community are devastated. Guns are dangerous. They are designed to kill. And kill they do. Yes, a gun by itself doesn’t kill unless there is some sort of discharge of a gun that ends up killing some by accident like this one where an Iowa Veteran dropped a gun that discharged and the bullet killed him. This is only one of many like this. People with guns kill many people and themselves every day in our country. They are not killing people very often with knives, hammers, clubs, chairs, or other heavy items. It’s the guns. And I can’t leave this topic until I write about the one of the Washington man taking a selfie with a gun who ended up dead as a result. Uffda. Be careful out there. The trigger-happy head of the National Rifle Association warned women Thursday that they face a dangerous future should Hillary Clinton wind up in the White House. LaPierre, speaking at a conference hall where weapons were banned, took aim at Clinton, telling the Democratic front-runner to “bring it on” in the fight over gun control. “All of America’s women, you aren’t free if you aren’t free to defend yourself,” NRA CEO Wayne LaPierre said during a rambling speech at the annual Conservative Political Action Conference. Is this a challenge? And God-given? Find me a place in the Bible or other religious writings about guns being given to people by God. This is stupid and dangerous rhetoric and also ludicrous. LaPierre just can’t fathom that people who want to pass laws to prevent shootings aren’t coming for his guns. American women should be very afraid when Wayne LaPierre ramps up fear and paranoia as he does when he speaks. LaPierre’s remarks were condemned by the Newtown Action Alliance, a gun control pressure group formed in the aftermath of the Sandy Hook killings. It’s chairperson, Po Murray, said: “Wayne LaPierre supported universal background checks until the NRA decided to pursue an extreme agenda of arming anyone, anywhere and everywhere. He will say and do anything to elect a president who will promote the gun lobby’s efforts to put guns everywhere in a greedy pursuit of corporate profits for the gun industry. His job is to fire up the NRA supporters with fear, lies and rhetoric. A gun of a security guard was left in a school bathroom. An officer’s gun discharged in a school. Thousands of children have died of gunshot injuries in their own homes since the Sandy Hook shooting because LaPierre and the gun lobby has convinced them that guns in the home will protect them from evil lurking around every corner. LaPierre’s claims that the media savaged him is ridiculous. If they criticized him, it was for good reason. His words ring false. You just can’t make this stuff up. The overwhelming majority of Americans actually do NOT agree that “the only way to stop a bad guy with a gun is a good guy with a gun.” In fact the majority of Americans agree that we should require background checks on all gun sales to prevent some of our shootings. We can only guess at what LaPierre meant by the last line in the highlighted paragraph above- more of the same angry rhetoric that means nothing. We are better than this and we’ve had #enough of the ugly lying rhetoric. This is about saving lives.